We are excited to provide our customers the XLTour e-bikes that are the brand new fashion product when it comes to urban electric mobility . We offer you to discover Paris with our guide. With our bikes forget the stress of urban classics transports , very comfortable and silencious they will propel you up to 25km/h in the streets of Paris . With their large tires , their disc brake system and their comfortable stool our scooters are accessible to everyone , their handling doesnt require more than 5 minutes . This is where your tour start and where you are gonna learn how to drive safely our electric scooters . You will see the Vendome place and the Vendome column. You will pass next to the Tuileries gardens . You will see the Louvre Palace as well as the Triumph Arch and the Pyramid of the Louvre Museum . You will see the Bridge of Arts also called the lover's bridge. You will see the Cite Island and the cite Palace from the docks. You will pass through the Saint-Louis island. You will see the Notre-Dame Cathedral. You will pass next to the Saint-Michel Fountain and the famous Latin district. You will pass next to one of the biggest museum of Paris , the Orsay Museum. Relax and drive along the Seine river on the docks without any traffic. You will see the National Assembly where the french deputees sit since the French Revolution of 1789. You will see one of the most beautiful and famous bridge of Paris. You pass next to the Branly Museum . You will see the Trocadero place and gardens and the Chaillot Palace . You pass next to the modern art Museum of Paris also called Tokyo Palace. You will see the Liberty Flame which is also the place where Lady Diana lost her life in a tragic car accident. You seee the Big and the Small Palace . You will see the Invalids place and hostel . We were a group of 6 persons (adults!) 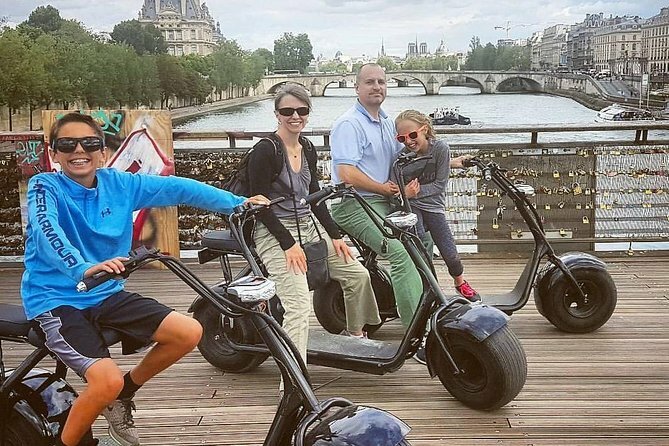 who had a wonderful time cruising through Paris. Amazing how far you can go for 2 ½ hours. It was pretty easy to ride the E-bikes (some of the wives were a bit afraid in the beginning, but quickly they learned it)! Our guide was really professional and helped excellently with the traffic and planned a superb tour! Absolutely recommendable - but only for adults.